The ever-popular mason jar is perfect for serving, storing, and preserving recipes to eat now or enjoy later. With more than 60 of our best test kitchen-approved recipes, this little book is simply fun to use for any menu or celebration on your calendar. Quick and easy to serve, or just to make ahead, you will find delight in every jar! 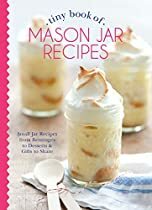 From Beverages and Salads to Entrees and Desserts, the Tiny Book of Mason Jar Recipes is packed with goodness! Plus, get fun gift ideas for all!